The audience witnessed a unique movie that showcased the love vs friendship concept and how if friendship is strong, it can save you from all the bad relationships and people through the movie Sonu Ke Titu Ki Sweety. The movie directed by Luv Ranjan had Kartik Aaryan, Nushrat Barucha and Sunny Singh playing the lead roles of Sonu, Sweety and Titu respectively. 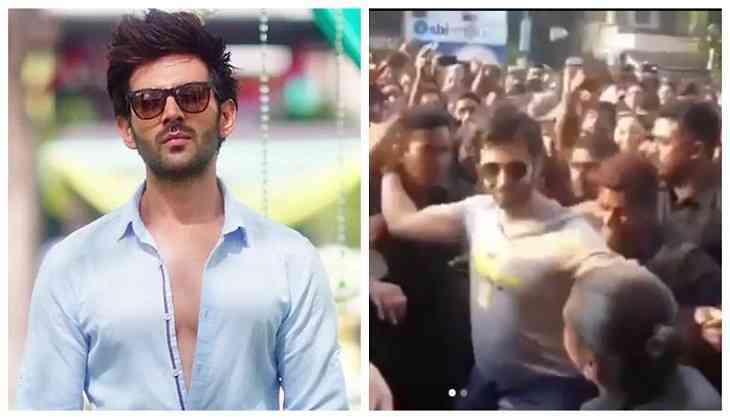 Kartik, from the first movie of Ranjan, Pyaar Ka Punchnama made a lot of fans, especially the female ones and after the release of the further movies like the second part of the film and SKTKS, the numbers have only increased. But sometimes, having a huge fan following can create trouble for the celebrities since sometimes they can create havoc for the stars. Similar incident happened when Luv, reached Kolkata to attend an event and during the same he got injured because of the huge number of fans that were present at the moment. The actor along with his security men stepped down from the stage to move toward his car and at that time his fans went crazy to get clicked with the actor and get a glimpse of him. The condition went out of control when because of one of his fans, he got mobbed and a huge scratch was left on his hand. The actor, however, did not disappointed his fans and left the place with all the calm and smile on his face. He proved that he is truly a gentleman in true sense of the word. Recently the actor walked the ramp along with Kareena Kapoor Khan for Manish Malhotra and grabbed the eyeballs of many. The actor has made his name in the list of those actors of the industry who have not given a single flop. He is being approached by many big banners for the next project. It is being said that the actor has signed films with Karan Johar. Not only this, even Sanjay Leela Bhansali has approached him for his next project. Talking about his personal life, it was earlier being said that he was dating his constant co-actress Nushrat, but these rumors were all put to rest when some pictures of the actor along with a mystery girl went viral on the internet and people started calling her Aaryan's girlfriend. Talking about the sad incident that happened with the actor, we wish the actor a speedy recovery.